Reducing credit card debt is usually a consumer's first step towards financial freedom. Credit card companies entice consumers in with low introductory rates, cash advance checks and other gimmicky promotions. What consumers don't realize is that they are at the credit card company's mercy. That low introductory rate can quickly turn into a 30 percent annual percentage rate. By reducing your credit card debt, you will free up your finances for retirement, college and other savings venues. Make a list of all of your credit cards. Start with the smallest balance on the top of the list and the largest balance on the bottom. Also write down the minimum payment that is due on the credit card at this time. Credit card minimum payments go down as the balance goes down, which increases the payoff time exponentially. Stop using your credit cards. If you cannot pay cash for an item, do not purchase it. You will never get out of credit card debt if you do not stop using your credit cards today. You can cut them up, freeze them or shred them--whatever you think will help you stop using them. Pay the current minimum payment on your account, or more, every month. As the balance goes down, and subsequently the minimum payment is reduced, do not reduce your minimum payment. This is one of the easiest ways to reduce your credit card debt. Does Paying More Than the Minimum on a Credit Card Increase Your Credit Score? Use unexpected income to boost your credit card payment. If you receive unexpected income, instead of considering it a ticket to splurge, put the total amount of the unexpected income onto your smallest credit card balance. This will help expedite the card's payoff, thus reducing your overall credit card debt load. Roll over the minimum payment from a credit card that has been paid off onto the next credit card in your list. If you have multiple credit card accounts, as one is paid off, apply that card's minimum payment to the payment you are making on the next account. Your total monthly credit card payment remains the same however the payments are restructured. This will also quickly expedite your credit card payoff. Consider liquidating certain savings accounts to pay off your credit card debt. Do not liquidate retirement funds, as the penalties are prohibitive. If, however, you have a savings account earning 1 percent interest, use a portion of those funds to pay down on a credit card charging a higher interest rate. Do not completely liquidate your savings, as you will want access to non-credit card funds in the event of an emergency. Track your progress visually. Put a pie chart up on your refrigerator and update it every month. As you see your progress daily, you will be more motivated to stay on track to reduce your credit card debt. 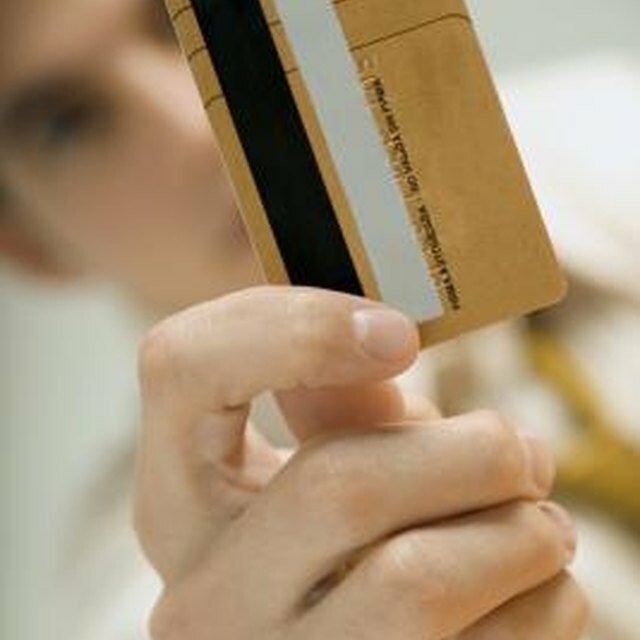 Some consumers prefer to list their debts by the order of the interest rate paying the highest interest rate card first. This will usually shave a couple of months off of your debt repayment and save some money in interest. However, many consumers feel a rush when they pay off a credit card, which is easier when your smallest credit card is receiving all of the financial attention.